9pk Oregon Hi-Lift Blade Bush Hog FTH ATH 720 Finish Rotary Mowers 88773. 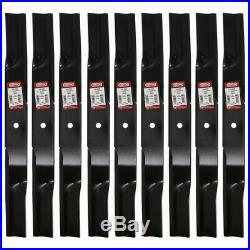 Set of 9 Oregon Hi-Lift Blade Replaces OEM Part Numbers: Bush Hog 82325, 88773, Country Clipper H-2459, H-2501, H2397, H2459, H2501. Genuine Oregon Product Replaces OEM Part Numbers: Bush Hog 82325, 88773, Country Clipper H-2459, H-2501, H2397, H2459, H2501, Grasshopper 320250, 320251, 320252, 320253, 320254, 320255, 320323. Fits: Bush Hog ATH720, FTH720 Rotary Finish Mowers. Fits: Country Clipper SR1220, SR1220L Zero-Turn Mowers. Superior mulching for bagging and discharge efficiency. 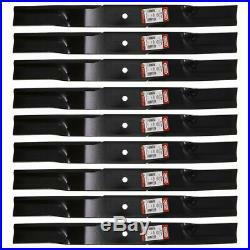 The item "9pk Oregon Hi-Lift Blade Bush Hog FTH ATH 720 Finish Rotary Mowers 88773" is in sale since Tuesday, March 19, 2019. This item is in the category "Home & Garden\Yard, Garden & Outdoor Living\Lawn Mowers\Lawn Mower Parts & Accessories".